Scale Model Building with Metodi Metodiev: Is scale modelling stuff overpriced? Part I - compressors. Is scale modelling stuff overpriced? In first glance some items doesn't seem to be that expensive. 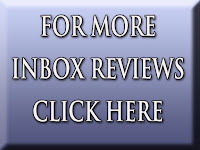 A jar of my favorite Mr.Hobby paints is 1.99$ (without shipping) in LuckyModel. That's about the same as in my local hobby shop. You see 1.99$ is OK price to me but when you actually realize that this is 10ml container things get interesting. Convert that 1.99$ for 10ml to $ for liter... amazing isn't it... this paint cost 199 USD per liter (33.814 US fluid ounces), MRP costs about the same. Ok, a jar of paint goes a long way so no one really cares. What about something else, something a bit more expensive? In this article I will compare several scale modeler targeting compressors with some general purpose oil-less compressors. The prices of the Iwata and Sparmax units as well as the technical information about them comes from www.air-craft.net. The prices of the general purpose compressors is also from online stores. Prices does not include shipping costs. Updated model of the popular TC-610H airbrush compressor, featuring a new case design with top mounted pressure adjustment, pressure gauge & removable twin airbrush holders. 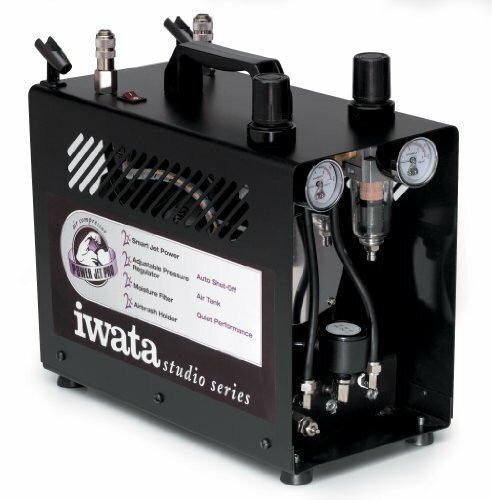 Just like the previous TC-610H, the TC-610H Plus is a powerful, quite & reliable oil free automatic single piston airbrush compressor fitted with a 2.5L air tank. The TC-610H Plus is automatic - when the air tank pressure falls below 40psi, the compressor runs to recharge the tank back to 60psi & then switches off - the compressor running to the demand of the air tank, rather than switching on/off every time the airbrush trigger is pressed. The TC-610H Plus is enclosed in a sturdy steel case with carrying handle, case top mounted adjustable pressure regulator / moisture filter, output pressure gauge & two removable airbrush holders. The pressure regulator has 2 x 1/8" BSP-P air outlets (1 x blanking cover included) & is supplied with 1 x 3.0M braided air hose with 1/8" BSP-P fittings. Powerful oil free automatic twin piston airbrush compressor with a 2.5L air tank, the TC-620X has ample power for any airbrushing task & with its 2.5L air tank provides smooth & consistent airflow. Being automatic, when the TC-620X's air tank pressure falls below 40psi, the compressor runs to recharge the tank back to 60psi & then switches off - the compressor running to the demand of the air tank, rather than switching on/off every time the airbrush trigger is pressed. 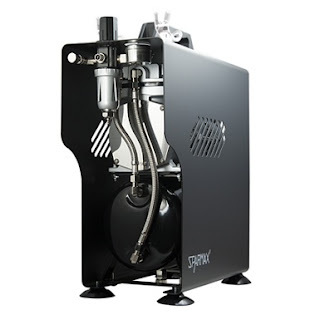 The TC-620X is enclosed in a sturdy steel case with carrying handle & is fitted with top panel mounted adjustable pressure regulator / moisture filter, output pressure gauge, twin airbrush holders & air tank mounted pressure gauge. The pressure regulator has 2 x 1/8" BSP-P air outlets (1 x blanking cover included) & is supplied with 2 x 3.0M braided 1/8" BSP-P air hoses. Featuring a powerful twin-pump, 1/6 Hp motor, the Power Jet Lite compressor is equipped with a pressure regulator for precise adjustment of airflow. Built with Iwata's Smart Technology, it automatically shuts off when not in use. Economically priced, the Power Jet Lite doesn't have a tank reservoir, yet delivers ample power. 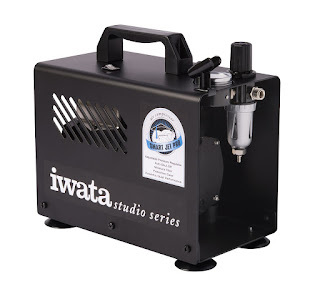 Like all Iwata Studio Series compressors, the Power Jet Lite comes complete with an airhose and adapters so it can hook up to most brands of airbrush. Featuring a powerful, zero maintenance, oil-free twin piston 1/6HP motor, the Power Jet Pro compressor is equipped with twice the features of the Power Jet Lite, with two air pressure regulators for precise adjustment of airflow at two individual workstations. Built with Iwata's Smart Technology, it automatically shuts off when not in use. Everything is contained in the Power Jet Pro's protective steel case with integrated carrying handle. 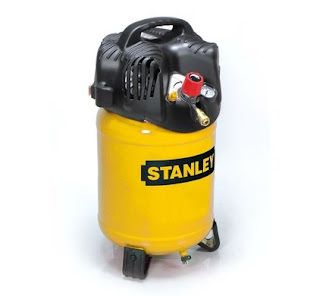 The Power Jet Pro's 2L air tank effectively removes airflow pulsation, helps air cooling, which gives better moisture separation & can act as an air reserve for higher pressure spraying. At this point this comparison is going to be based on numbers only. 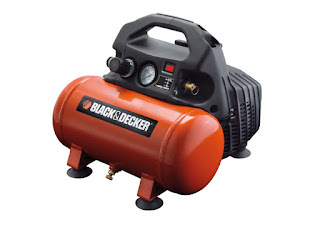 I do have a generic airbrushing compressor with DIY tank so I have a good Idea on how this type of compressors work and what are their drawbacks. So lets start with the price. In general the Sparmax and Iwata are significantly more expensive than their general purpose counterparts with the BD 55/6 being the cheapest and Iwata being out of their minds. Tank capacity. The GPs win this round effortlessly. The Iwata Jet Lite doesn't even have a tank... for 330 USD. Flow. Having larger tanks, the GPs need the higher flow to fill them in timely manner. 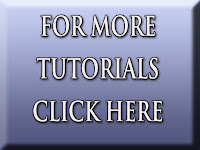 You may need a extra flow regulator in order to supply your airbrush correctly. Max. Pressure. GPs win again with 8 and 10 bar vs the 4.8 maximum of the Iwata Power Jet Pro. Noise. Here things turn around and the SMS win and they win with quite a margin. Further more the noise levels of the Stenleys is quite desturbing. The Black & Decker 55/6 is more acceptable and I couldn't find info about the 195/24. On the other hand the big capacity compressors give you the opportunity to spray with your airbrush for sufficient time with one fill thus in total silence (compressor is shut down). Weight. Here we have some surprising results. The lightest is the TC-610H, then comes the Iwata Jet lite, which is strange as it doesn't have a tank. Next come the two 6 l. GP compressors, which is also surprising given the fact that they have bigger tanks that have to sustain bigger pressure. As expected, the two 24 l. ones are the heaviest of the pack . Dimmensions. The SMS compressors are more compact, but the GPs are not that much bigger. Connectivity. No, none of them can connect to your smart phone. 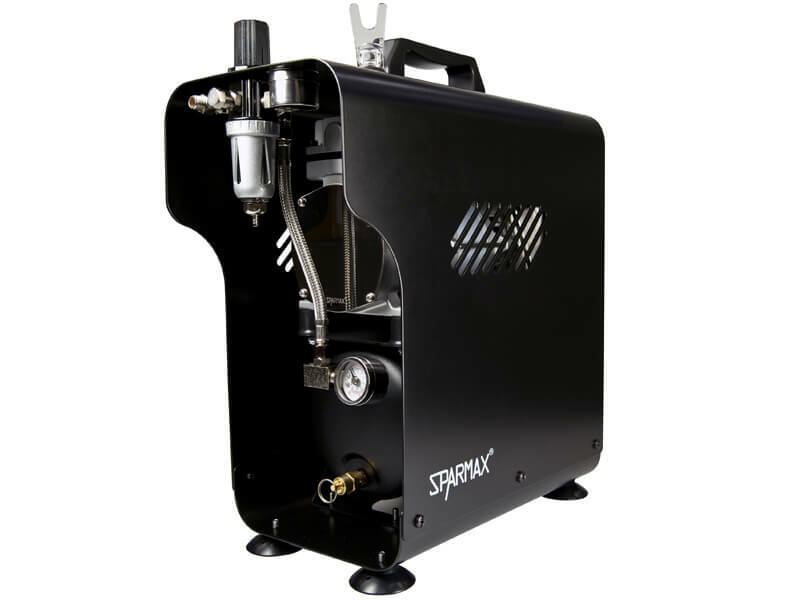 Instead, with both Sparmaxes you can connect your airbrush using two 1/8'' connectors via 3 m, 1/8'' braided hose which comes with the compressor. Both Iwatas have 1/4'' male connectors. The Jet Pro comes with a hose with 1/8'' connector on the airbrush side. The general purpose compressors come with 1/2'' quick release connectors so they need some extra hardware to fit the airbrush hose. My conclusions. 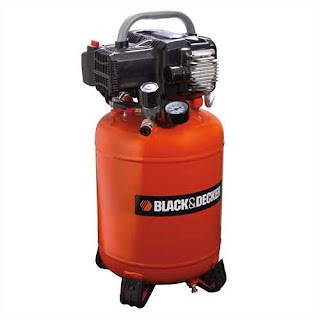 From my perspective as someone who is on the market for a new compressor, I am very tempted by the 24 l. Black & Decker. As I have the little extra space the bigger tank needs my only concern remain the noise level. Although I can surely use it in "silent" mode I still need to hear how loud is it wile working. 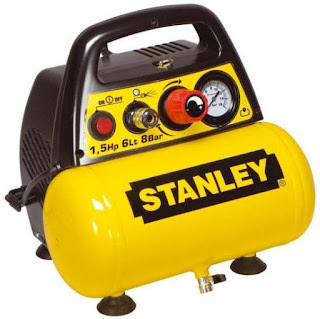 Another positive about the general purpose compressors is that I can go to the store and buy it, not having to pay for shipping and wait for who knows how long. As far as the scale modelling oriented compressors, frankly I think that they are overpriced. Ok, you get airbrush holders on the case... come on, who on the face of this planet will put his airbrush on the case of working compressor? Even with the extra bit of hardware that you will need the GPs remain much better priced. Other options. Of course there are plenty of other options out there. The generic 1/5 hp compressors with tank are around 80 USD without shipping on ebay. My experience with this type, although without a tank, shows that they can generate a lot of heat, thus overheating easily. Also if you search for "silent compressor" on ebay you will find nicely looking 65 db, 10 l. 8 bar compressor from Latvia. It costs 146 USD without shipping and is made by AlfaTek (or at least that is what the sticker on the tank says). This option seems legit and surely deserves attention. 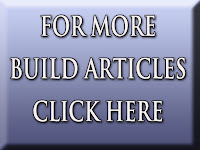 I hope that this article will help you to choose a compressor. 85/97dbA is a dealbreaker. You can't even comfortably be in the same room with it. At 97dbA it's only recommended 30 minutes max exposure. Those are only suitable for construction sites.